Alcoa announced shutdown of 532,000 tonnes of smelting capacity at the top of the cost curve to lower production costs and improve competitiveness. The 12% reduction of capacity mainly hits operations in the USA. After recently temporarily closing down Lanigan and Rocanville mines, PotashCorp now decided to temporarily close Allan mine to because of lack of demand for fertilizer. The combined shutdown of the three mines results in approx. 1 million tonnes of potash, or some 10% of the company’s annual production. A union representing copper mine workers in Zambia signaled the foreign miners will have to agree to higher salary increases than the average offer of 11% to prevent widespread strikes. At the same time Rio Tinto Alcan and Caterpillar are taking a strong position against unions in Canada by locking out union workers after expiry of the negotiation periods. The fear for slowing demand due to the lack of recovery after the financial crisis – With the financial crisis over 4 years old already the typical macro-economic cycle of 6-9 years has clearly been disrupted. Governments and companies are still operating in ‘crisis fighting’-mode because demand does not pick up like after a regular economic downturn. Large investments are still undertaken because the belief in the long term demand driven by population growth and growth of average GDP/capita is unchanged, but at the same time companies are trying to manage short term lack of demand by scaling down or temporarily closing operations. 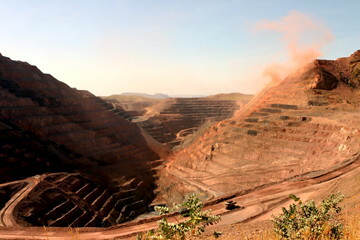 The fear for strikes and civil unrest resulting from struggling individuals facing mining companies that continue to realize high profits – Despite the financial volatility the commodity prices generally have remained high, making mining companies among the few companies in the world that continue to generate high profits. With people around the world facing the economic crisis and feeling its impact, friction develops between the rich companies and the less well off workers and neighbours. About half of the workers at Freeports’ Grasberg mine went on strike to demand higher pay, forcing the company to shut down operations. Several strikers have been killed by police and unknown gunmen in the past week. Rio Tinto plans to spin off 13 of its smaller aluminium assets for an estimated $8bln. The company wants to focus its attention on top tier assets. Rio Tinto buys Hathor Exploration, a uranium exploration business active in Canada, for over $500mln. Key asset of Hathor is Saskatchewan’s Roughrider deposit. Junior miner Ferrous Resources, worth just over $3bln, is looking for a buyer. BHP Billiton and a Chinese company are talking with management to negotiate a price. Freeport’s social troubles in Indonesia are the latest labor issue in a rise of labor unrest in the latest year after years of relatively peace in the industry. The unrest mainly affects copper producers, which have seen profits rise with high copper prices, but did not want to increase worker’s compensation too much to secure long term competitiveness. The large diversified miners are increasingly focusing their attention on a limited number of extremely large operations, divesting smaller operations. With the spending power of the ‘mining supermajors’ a divide seems to open between the few operators of the world’s key supply areas and the many operators of a range of smaller operations. Rio Tinto might face challenges selling the unwanted aluminium assets in one package. Very few companies are able to do acquisitions worth over $7bln, and many of the companies that have the spending power might face antitrust limitations. “Vladimir Potanin, the Russian tycoon, has defended controversial actions by the management of Norilsk Nickel during his bitter battle for control of the mining company with rival Oleg Deripaska, insisting that they have protected shareholder value. In his most extensive comments since the conflict flared up again last year, Mr Potanin told the Financial Times that his Interros holding company and Norilsk’s managers were not acting together against Mr Deripaska’s Rusal. The dispute became public after Rusal ended up with three board directors at last June’s annual shareholder vote, against Interros’s four. The aluminium group accuses Norilsk’s management of manipulating the vote in favour of Mr Potanin’s group. Despite holding 25% of the ownership of Norilsk Nickel and being on the company’s board, mr. Deripaska has not managed to exert control over the miner. Although Potanin’s Interros does not hold a majority in the board, it can count on the support of Norilsk’s management to control the course of the company. Rusal’s ally Metalloinvest, which holds 4% of Norilsk, is seeking to merge with the company. By trying to increase its share in the open market it could change the voting dynamics in future shareholder meetings to bring control over the company to Rusal’s side, enabling a friendly merger. Deripaska has announced not to sell Rusal’s 25% stake, but Interros will try anything to ensure he will not gain control. One of the current actions of the company to prevent Rusal from gaining control is a share buyback program via Norilsk’s subsidiary Corbiere Holdings. Together with Metalloinvest’s attempts to increase its stake this creates strong demand for the company’s shares.